Fleet Equipment Newsletter - Receive the latest news and industry trends, focusing on the issues that help fleets run the most cost-effective operations. Delivered to your inbox every Tuesday, Wednesday and Thursday. We’ve focused our email newsletter to create a more engaging and valuable product by highlighting Fleet Equipment’s in-depth feature and video coverage as well as the latest equipment and industry news. Delivered to your inbox 3 times weekly. FE On the Road Newsletter - Receive the latest video in the FE On the Road series every Friday in your inbox. Your weekly video webseries looking into the latest equipment trends and practices. 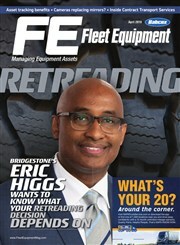 Fleet Equipment Digital Edition (Delivered to your inbox every month). Fleet Equipment Print Subscription (Mailed monthly). Fleet Equipment focuses squarely on the equipment that improves truck efficiency, provides quick ROI and low total cost of ownership. *Free print subscription requires a U.S. mailing address and that you meet certain qualification criteria. Does your fleet include the following vehicles? I would like to receive third-party business related information and offers by email.